3-2 Wash with 5 min left. Carolina has really picked it up in the third, outshooting 29-17 in the game. Svechnikov with both goals. Ovie with one and Backstrom with 2 for the Caps. This should be a great series. Anddd Washington with the empty netter. 4-2 win. Reddit was the only place I could find a video. I cannot watch this series primarily because of Carolina's jerseys. They're hideous to look at. BTW, it looks like we drafted the wrong Svechnikov. Yes, it was. They came close to making the Caps pay for it, too. Close game. Mrazek allowed three goals in the first, but wasn't much he could do about two of them. He looks different. Not playing erratic and jumping all over the crease, leaving his net like he used to. They sure are. Vancouver's are worse though. Seattle might beat them both, they like their yellow/green combos. Always liked the Seals jersey. Have one myself. The teal/yellow wasn't bad, but never liked the green/yellow. Which is weird because i dig the Oakland A's colors. I doubt they'd be using teal again unless it was subdued, due to SJ. And a match penalty for a Carolina hit. CONSISTENCY. Carolina tied it at 3 with around 5 to go! It'd be wild if the caps and bolts both lost in the first round. Overtime hockey at 6:00 on a Saturday. This is what playoff dreams are made of. Another close one. Aho needs to get going, hopefully he can do it at home next game. Ovechkin just KO'd Svechnikov in a fight. What the hell. Kid is only 19. Why didn't that dumbass do that to Crosby all these years? From what I'm reading, sounds like Svechnikov wanted to go with Ovi. I can't recall any instances where Crosby straight-up said "Let's dance!" 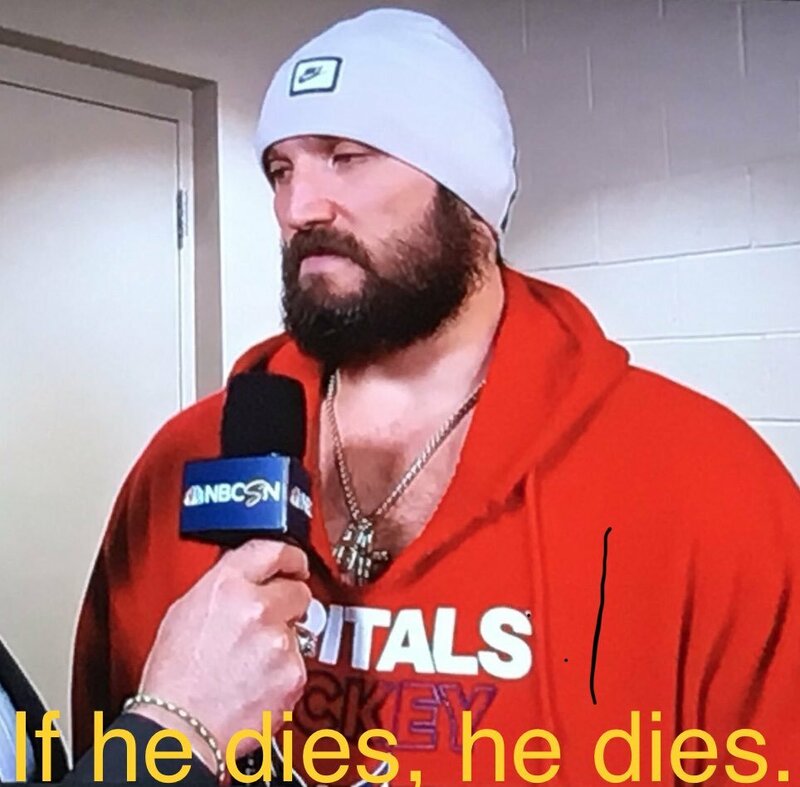 to a maniac like Ovechkin and really, truly meant it. There've probably been some instances, but I'm not a Crosby historian so I wouldn't know. Wings-Caps is the new Wings-Avs, change my mind. It's a shame the 'canes don't have a bit more firepower and muscle up front. I can imagine them being a real threat in a couple of years. Holy crap, Season 2019-20 looks amazing! Where's Nerve when you need him to make a 'gangsta' Ovi pic ? He went old school KGB on Svechs' azz. If he did that to Crosby, I'm pretty sure he doesn't leave the ice surface with his head attached to the rest of his body.